We like to make a fuss about our colorful silk lamp shades. Reflective luster and a nubby texture are the distinct characteristics of dupioni silk that make it special. It's a fabric that feels right at home with our jewel tone paint finishes and hand painted artwork. And oh how it adds to the ambiance of a room! Soft and serene, passionate and vibrant, the mood swings with a flick of a switch. 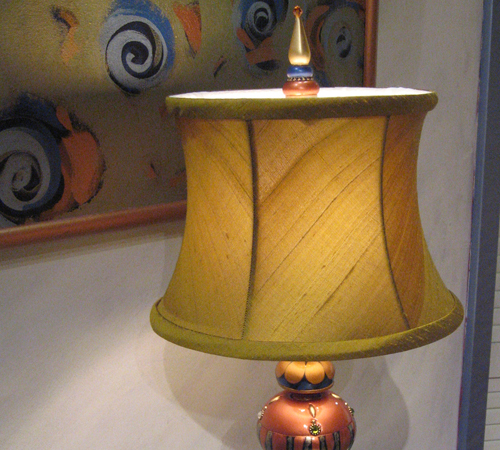 Susan Goldstick table lamps range in height from 20 - 36". Shade shapes and colors can be substituted. If you prefer a bell to a drum shape or a red shade instead of gold, contact us.